iOS multitasking explained, again | When Will Apple? There is a lot of confusion surrounding iPhone multitasking. John Gruber of Daring Fireball kicked off the latest round of debate with his article Mobile Multitasking. After reading his article and others like it, I decided to jump into the OS 4 multitasking write-up game. Most of the multitasking talk centers around the fast app switching dock. I’m going to cover that later, but before we get there I want to review the different app states: closed, suspended, and background. This is how apps work prior to OS 4. When leaving an app by pressing the home button, the app gets about 5 seconds to finish what it’s doing and save any pertinent info. The app is then purged from memory. Currently, all third party apps running on OS 4 beta still operate this way because they haven’t been updated yet. Even though apps returning from the closed state have to load from scratch, they can use the saved info to start right where you left off. The ability to read / write state data to the app’s own disk space is not handled by the system, but the app itself. This is why you already see this save state in current apps like Rolando, with its “iSave” feature, which lets you resume your game right where you left off. This is a new state introduced as part of OS 4 multitasking and available only on the latest (and future) iPhone and iPod touch models. When a user leaves an app, it’s put into the suspended state instead of closing it. The apps are held in memory and their process kept alive, but are given no CPU time. You can think of them as cryogenically frozen, they still exist and are alive, but can’t do anything until defrosted. Restricting the CPU usage in this way keeps the iPhone from getting bogged down, and more importantly, keeps battery usage close to zero. When returning to suspended apps, they start exactly how you left them without needing to load again. This gives you the feeling they were running the whole time. As nice as this sounds, it’s not truly a background app. No CPU means it cannot process any data in the background. For example, after leaving a Twitter app, it’s no longer updating your stream. When returning to the app, all the latest tweets will need to be downloaded. As most OS 4 compatible apps will fall into this category, it means push notifications are still going to play an important role in iPhone multitasking. This is a special state, applicable only to certain types of apps. These are true background apps given CPU time while working behind the scenes, but are only able to use resources to perform a specific task. I think the easiest way to explain this is to discuss the details of how a few apps work. UPDATE 6.25.2010 Added TomTom example for background navigation. You are jamming with Pandora as you always have, but then decide to check out a band’s website. You press the home button to leave Pandora and fire up Safari. As a background audio app, Pandora is not put into the suspended state, but remains running as long as it’s streaming audio. When running in the background, the app must only use system resources to process the audio stream. For example, when a song changes, Pandora will not update the screen view to show the new artist info, as this would be a waste of CPU resources for something the user can’t see. A task like this can easily be taken care of when you return to Pandora as it’s moving from the background to the foreground. So after an hour of rocking out with Pandora you notice your battery is getting low, how do you stop it from running in the background? Easy, the same way you do now with the iPod app, just go into the app and hit pause. The only way Pandora is allowed in the background is if there is music streaming, so this time when you leave the app it’s sent to the suspended state. There are two different scenarios when dealing with voip: waiting for a call and on a call. Apple’s solution when waiting for a call is perfect for keeping battery usage to a minimum. After logging into Skype and returning to the home screen, the app is not kept in the background like Pandora. Instead Skype enters the suspended state and lets the system monitor its connection to the voip server. When a call comes in, the system moves Skype from the suspended state to the background state. Skype does not automatically open, it’s still only in the background, so what you are currently doing is not interrupted. The call data is then processed and a local notification (another one of the 7 background APIs) is created to alert you a phone call is coming in. If you ignore the call, the connection is handed back to the system and the app returns to the suspended state. If you pick up the call, the app opens in the foreground and the call is connected. If you decide your buddy is boring and you want to check some email while pretending to listen, it’s no longer an issue. When you open up mail, Skype continues to work in the background, very similar to the audio apps. When the call ends, Skype hands the connection back to the system and goes to sleep. To close Skype, just open the app and log out. When leaving Skype with the voip server connection closed, it goes into the suspended state until you login again. This is a hypothetical example of how Facebook could work if programmed to do so. You are finished playing around on Facebook and just waiting for a bunch of pictures to upload. You leave the app and return to the home screen. Instead of immediately suspending the app, cancelling all your uploads, it requests extra time to finish in the background. When the upload is complete, the app is then put into the suspended state. 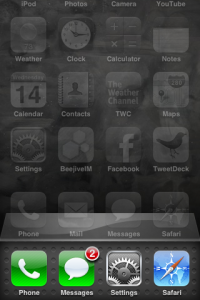 Receiving a phone call while navigating is no longer a problem on iOS 4. Now when you take a call, the app will popup request your permission to continue navigating in the background. If granted you will still receive turn by turn direction while on the call. This also works if you leave the app to do something else, like check email (hopefully you aren’t the driver). The app continues to track your current location, but to save battery it’s not updating the map. When you return to TomTom it will take a few seconds to reposition you on the map. What happens when you’ve arrived and want to shut it off so it doesn’t drain the battery? No, you don’t need to manually task manage and force close. When you reach your destination and are no longer navigating, it will automatically stop using the background navigation and go into regular suspend mode when you leave the app. If you leave the app while still in navigation mode and disconnect from power, you’ll soon get a local notification popup asking if you would still like to navigate in the background. Tap no and send TomTom into suspend mode. You can always confirm that it is no longer running in the background by looking for the new GPS arrow icon (see picture below)…if it’s gone, it’s not navigating. What is the fast app switcher dock? The fast app switcher, or hidden dock, is a new task bar that slides up from the bottom of the screen when you double tap the home button. The new dock doesn’t just list your background state apps that are actually running, but contains ALL the apps you’ve opened no matter which state: closed, suspended, or background. To the end user it doesn’t really matter if the apps are technically running or not; I guess that’s why in the OS 4 keynote Steve Jobs said “I can just double click the home button…and the window raises up and it shows me all the apps that are running.” The apps are ordered left to right by most recently used, so you have quick access to the apps you use most. Wait, wasn’t double tap home button a shortcut for my phone favorites, iPod, or Camera? Yes, it was. To perform the home shortcuts on OS 4, you just need to double tap and hold. Might be confusing at first, but should catch on pretty quick. 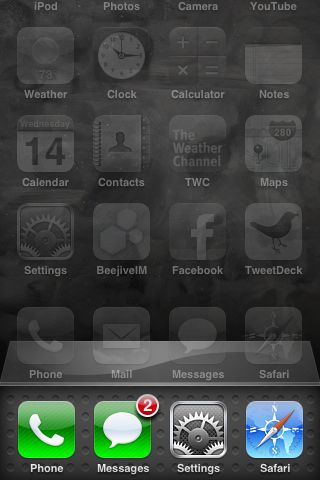 UPDATE This double tap and hold was removed from the final iOS 4 release. There is a new feature for controlling the active audio device. To access this you bring up the fast app dock and move left (see picture). Unfortunately the favorites we all know and love are no longer available. Is the fast app switcher dock a task manager? You can manage your apps manually in the hidden dock by removing them, which sends them to the closed state, but what Steve said still holds true…the users don’t have to think about it. A regular user on OS 4 can get along just fine without closing apps manually or even looking at the hidden dock at all for that matter. All the operations of managing the apps for memory and CPU concerns are taken care of automatically by system, so there is no advantage to closing them yourself. Another important factor is the ability to close apps (stop background processing) through the app’s user interface, like the Pandora and Skype examples earlier. I assume this will be a requirement for every background capable app1. If not, then what Jobs said is no longer vaild. UPDATE 6.25.2010 1Some apps, like Pandora, close in a very intuitive way…stop the music, stop the multitasking. Other apps need a bit more thought, but properly designed, they won’t need specific close buttons in the user interface. A perfect example of this is the TomTom app I recently added to the background state apps above. How does OS 4 decide when to close apps? When a new app is opened that requires more memory than is currently available, OS 4 automatically closes suspended apps in least recently used order. The next time you open an app that was closed by the system, it will need to load again just like it does on OS 3.x. You will lose the quick start up, but if the system closed it you probably hadn’t used the app in some time anyway. If even more memory is required, the system starts closing background apps (like Pandora) in the least recently used order. Apple’s first step into multitasking looks great to me! Their strategy will automatically grow with the hardware. For example, when the 4th gen iPhone is released with 512MB of memory (I love speculating [no longer speculation, I was right]), it will be able to keep more simultaneous apps suspended / backgrounded. Also, as the hardware improves, additional APIs could be added to allow a wider variety of apps to work in the background. iPhone 4 to double the RAM to 512MB | When Will Apple? TomTom app updates to iOS 4, includes multitasking | When Will Apple? Martin, when the data is just sitting in RAM and not being accessed it uses an immeasurable about of battery. What uses battery is moving data in and out of memory from the flash storage and, most of all, the CPU. It actually saves better by not having to load apps in an out of RAM every time because the data is already there, plus it doesn’t need the CPU process all the data and load up the app again. Hi guys, and thank you for the article. Unfortunately I do not even have the multitasking bar showing. I double tap, double tap and hold, change my settings and so on… I’ve never seen this great feature. Any ideas? Thanks for this post. I’m using ios4 on my iPad currently. And worried that apps showing in the hidden tab will drain my iPad’s battery. If this is the case, I don’t have to worry about going there and closing apps. Just hope that what you wrote in the post is based from a reliable source. No offense. Thomas, only the 3GS running iOS 4 or higher can multitask. Aidil, I researched everything from the iOS documentation provided by Apple. iPad user new to iOS 4 multitasking? Here’s what you need to know | When Will Apple? Excellent – helpful article. Thanks! The technojungle is so crowded with words – your thought organization is super which makes your comments so helpful! Nice article, but it repeats an Apple myth. The fast-app-switcher-bar is indeed also a task manager: it has the functionality to kill apps, which is handy especially with older apps that might malfunction under 4.x. Kevin, you are missing the point. Yes, you can kill 3rd party apps with the fast app bar, but there is no reason to do that. It is handled automatically by iOS. Basically Jobs is saying you’ve failed if you leave it up to users to manage system resources. Like you pointed out, the only reason you would need to force quit an app is if it half crashed or something and got stuck in a weird state. You could then use the fast app bar to kill it, or just enter the app, hold power button down until the off slider appears. Then press and hold the home button (same as iOS 3.x). There is no provision to run the background task for long time. I have tried to use background task for long time and next time when app enter in forground… there is no way to end that task because no method was called which shows that app entered in forground….. Overall I do not think there is any method to run a background task(like sending location data to website) for long Interval of time..
What a great article!!!! You answered my original question, held my interest, and gave me answers that made me delve deeper into the subject mater you presented. Very well done! Thank you so much for this information that was not available anywhere else. The only detail i see is thar when one has 30 apps opened on has to keep on clicking the close button. Otherwise multitasking on the ipad, phone, etc is awesome. I would love a “close all apps”button. I think that is one little missing thing, but it is still awesome. Justin, with regard to your reprimand of Kevin and his assertion that the fast-app-switcher-bar is indeed also a task manager, I suggest that YOU have missed the point. It may not appear to be a task manager, and Jobs/Forstall probably don’t want them to realise that that’s what it is, but it is. And it’s useful, in spite of Forstall’s ‘..you don’t have to’. Arrrgh! Some people just may have old habits, they may be tidy, or they may want to minimise the number of apps they have to scroll through to find the one they’re looking for. Any number of other reasons. “How can I dry myself off?” “You don’t have to; the sun’s out and there’s a nice wind..” Arrrrgh! Sweet n simple explanation. Many thanks. your article. Thanks a lot and I am having a look ahead to touch you. Thankyou my understanding of running apps is better now with your informative post,thanks again………….Dave. Thanks for one’s marvelous posting! I truly enjoyed reading it, you will be a great author. I will be sure to bookmark your blog and may come back in the future. I want to encourage one to continue your great writing, have a nice afternoon! weblog offre funzionalità di base di scrittura . Look at the charge of making a call in terms of connection cost plus the amount charged for each minute of use. “Woe to you lawyers also, because you load men with burdens which they cannot bear”, Luke 11:46.
three-tier hierarchical model comprising the core, distribution, and access layers. viruses comes from the Internet. Places where you can buy things throughout the country. the horrifying image of emancipated men piled on top of one another) capture the true horror of this war. Card tied to pharmacy rewards. Books and other multimedia are available for online viewing and instant download. words on what the recipients leadership accomplished. I aam quite sure I’ll learn plenty of neew stuff right here! Avez-vous déjà considéré pensée sur y compris ajoutant un peu plus que juste vos articles? Je veux dire, ce que vous dites est importante et tout. Néanmoins imaginez si vous avez ajouté quelques grands visuels ou Vidéos pour donner à vos messages plus “pop “! clips, ce site web pourraient certainement être l’un des grand domaine. with only the shirt on your back and some cash to purchase things in the new location, or some combination of the two. Reliable California movers take care of long distance moving throughout the nation. awesome and actually excellent information in favor of visitors. The table of figures giving reasons for leaving the employment of Leyland Motors in 1943-45 p.
no download speed is 40 d/s The T71′s speed limit is 64 km/h. generator no download fought alongside M4s and M46s. so make sure you get it all. and views online. Please let me know if you have any kind of suggestions or tips for brand new aspiring blog owners. views of all colleagues about this paragraph, while I am also keen of getting knowledge. impossible to monopolize it simply because nobody has a monopoly on good ideas. You can also draw images or create a movie scene in your mind while doing this. According to the industry association there will be a need for 1,000 new storm adjusters in 2007 alone. should consider the image and reputation of each of the company’s they have selected. the type of decorations they will provide. In terms of finding the best male sexual aids, you don’t have to look quite far. by fans and critics alike, proving after again that L.A. Guns were on prime of their game with extra tracks “You Much better Not Adore Me” and “Sweet Mystery”. what I needed. I so much for sure will make certain to don?t omit this website and provides it a look regularly. Ivisited multiple web sites еxcept the audio quality ffor audio songs ρresent at this website iis reallу wonderful. Pretty component to content. I simply stumbled upon your blog and in accession capital to assert that I acquire actually enjoyed account your blog posts. Eagles the following season, but his attitude would once again create more controversy. gemstones as are used by the psychic to improve their psychic ability. Briefly, Mi40x is essentially the most propitious, reliable, and progressive workout schedule we now have seen to build muscle and burn fat. coaching, nutrition and medicinal suppressants. is to see that so many people begin to flock to getting this nice various power resource in the residence. but you may use them in combination to maximize your power manufacturing and reduce your funding. Solar tools remains to be laborious to seek out, althought the work is simpler than a decade in the past. Hurrah! At last I got a weblog from where I be able to truly take valuable data concerning my study and knowledge. at a much higher temperature than other pieces that can be recycled. and created outdoor furnishings for his really very own rustic cottage. Tip: Hosting location can influence search engine ranking positions. also permit your customers to scan throught your internet site more easily. and Intel – which are some pretty formidable opponents. From alien invasions to talking bears, this article has something for the entire family. ddin organism, fara ca acestea sa poata fi transformate in grasime. Produsul astfel obinut ese foarte concentrat, pastrandu-se totodata toate calitatile si substantelle fructului. inainte de masa, cate 2 capsule pentru a urma o cura de slabire cu Acai verde. enterprise, visitors are involved in studying the content excellence. bang for your buck when it comes to paying for a first page Internet search. hack that really helps when one has to replenish needed resources. Magnificent website. A lot of useful information here. I am sending it to some pals ans additionally sharing in delicious. And naturally, thanks to your sweat! of the day and win a predetermined chip amount. I mean iOS multitasking explained, again | When Will Apple? to pay a visit this site, it consists of useful Information. if only you use Pixel Gun 3D Hack. MovieStarPlanet is free to play, nevertheless, gamers can pay to gain entry to prolonged options and fast-observe their rise to fame. shed the armpit hair. The volume of options are endless inside flavors and ingredients to evaluate. a number of dollars for this sport. Personally, I myself have gotten a whole lot of hours out of this sport already. You cannot buy anabolic steroids truthfully nowadays.